The team bus of Nigerian Premier League side Ikorodu United was involved in an accident with a trailer on Friday, en route to the central Nigerian town of Makurdi for a weekend fixture against Lobi Stars. The accident happened along AMA Brewery Road 9th mile in the south-eastern town of Enugu. A team official and seven players were treated in hospital for minor injuries, with 11 players and six officials of the Lagos-based side escaping unhurt after jumping out of the bus windows. 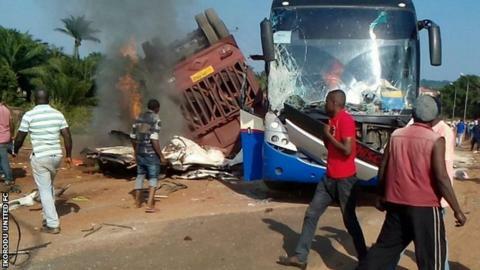 A trailer was speeding in the direction of the Ikorodu bus, but the driver quickly swerved before the trailer crashed into another passenger bus, leaving it completely flattened, a team official said. "It was a scary moment but we all managed to get out of the bus through the windows," team media officer Babatunde Ayoola told BBC Sport. "We are lucky to be alive because the crash impact killed all the passengers inside an 18-seater bus on the spot. "The team is leaving Enugu and returning to Lagos. It's an awful experience but we thank God for our lives." Ikorodu United sit bottom of the Nigerian top flight and Sunday's match against Lobi Stars has been postponed indefinitely. Nigeria's roads are among the most dangerous in the world - killing thousands of people every year - due to poor roads, badly maintained vehicles and reckless driving. As the country's economic problems have worsened, clubs have been forced to cut their travel expenses, making hazardous road journeys unavoidable for most clubs. In December 2008, 18 female players were killed in Plateau State when their team bus was involved in an accident. Barely a month later 15 players from FC Jimeta of Adamawa were also killed in a road accident near Akwanga, central Nigeria on their way to Abuja for a professional league match. Last year five Kano Pillars players were shot by gunmen in an attack on the club's entourage as they travelled to Owerri for the start of the 2015 Nigerian Premier League season.